Habitat: Found in a variety of semi-aquatic environments that occur at the boundary between permanent water and land, such as farm ponds, swamps, rivers, bayous, drainage canals, freshwater marshes and land coastal areas. Description: Large rodent, about the size of a beaver, with a long, rounded, ratlike till. Hind feet are webbed and incisors are orange colored. Upper coat is reddish brown with dark underfur, and a white muzzle tip and chin. Ecological Impacts: Burrows in stream banks, feeds on bald cypress and other native species. Nutria, also known as coypu and river rat, is native to temperate and subtropical South America. 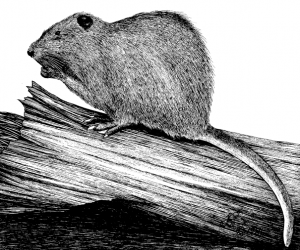 Introduced to Europe, Asia, and Africa, these voracious, herbivorous, semiaquatic rodents were brought had been brought to the US in 1889 for their fur; smaller than a beaver, larger than a muskrat—as everywhere else, they escaped into wetlands, chewing through whatever needed to be chewed through (rubber tires, wood siding) along the way. By the 1950s, there were 20 million nutria in Louisiana alone. Crops and levees were being damaged by their munching and digging. Should the state promote their fur—and protect their numbers—as a natural resource, or declare them a pest and get rid of them? The state got all that worked out, siding with the furriers, when, in the 1980s, the bottom fell out of the international fur market. Lately, a few innovative designers have turned their attention to this furry invader. In 2009, Cree McCree founded Righteous Fur in New Orleans, creating a line of clothing from the soft brown fur and jewelry from the orange teeth. In 2011, the Marsh Dog pet company started a line of dog treats to help in the fight to conserve Louisiana’s wetlands. The nutria are sourced from the Barataria-Terrebonne Estuarine System in southern Louisiana, which is threatened by the rodents’ consumption of marsh plants. We’ll probably be seeing more of the nutria. Climate change, accompanied by heavier rains in some areas, could extend their range north, since they would rather swim than walk. For more on the history of the nutria release see Shane K. Bernard’s “M’sieu Ned’s Rat? Reconsidering the Origin of Nutria in Louisiana: The E. A. McIlhenny Collection, Avery Island, Louisiana” in Louisiana History. 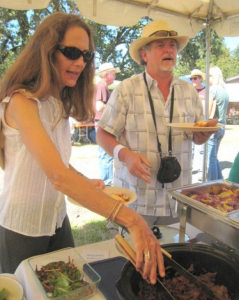 Dave Budeau’s award-winning recipe from the Institute of Applied Ecology’s Invasive Species Cookoff. Read more about it here. 1. Before smoking, soak nutria in a simple brine. On the stove over low heat, dissolve the salt and sugar in about half a gallon water. Once the salt is dissolved, remove from heat and add another half gallon of cold water, add nutria, and place in refrigerator. Leave nutria to soak for 24 hours. 2. Remove nutria from brine and pat dry with a paper towel before placing on smoker racks. A small electric smoker can be used to control both time and temperature. 3. Smoke nutria for three to four hours at about 190°F. Add new chips about every hour. Nutria will be cooked when the thickest parts are at least 180°F using a meat thermometer. To retain moisture in the meat during the smoking process, close the smoker and add some apple cider in the moisture pan at the bottom of the smoker. 4. 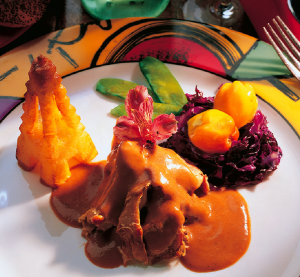 After nutria is cooked, use a fork to shred the meat and separate from the bones. Place shredded meat in a bowl and mix with about a cup of barbecue sauce. 1. Layer onion, tomato, potatoes, carrots and Brussels sprouts in a slow cooker. 2. Season nutria with salt, pepper and garlic, and place it over vegetables. 3. Add wine and water, cook on a low heat until meat is tender (approximately 1 1/2 hours). What’s not to love about this recipe, which calls for not one but three invaders? 1. In a large bowl, mix the nutria, wild boar, crawfish, water chestnuts, mushrooms, onions, and Thai seasoning. Brown the mixture in a heavy skillet over medium-high heat. 2. Remove from the heat, drain, and cool. 3. Place 2 ounces of the mixture in each egg roll wrapper. Follow directions on the wrapper package for rolling and sealing the egg rolls. 4. Pour 3 inches of oil into a heavy, deep saucepan. Heat the oil to 350 degrees. Fry the egg rolls until golden brown. 5. 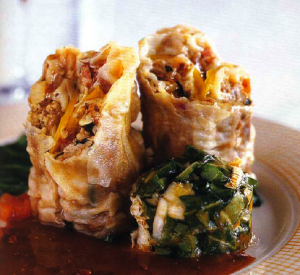 Place three egg rolls in another wrapper and brush the edges of the wrapper with the beaten egg. Fold the edges over to create a bundle. Repeat until you have used up all the egg rolls. Fry the bundles until golden brown. 6. Slice open each bundle across the top on the bias. Place the egg rolls upright on a plate and serve with a sweet and spicy sauce. Love this website and plan to highlight it often on our Facebook page! Meet Marsh Dog! We’re a company that makes all-natural dog biscuits using wild Louisiana nutria and locally grown produce. Each year the state spends a considerable amount of $ to harvest nutria and minimize the damage they inflict on coastal marsh. Only a very small number of these harvested nutria are used for fur with the remainder wasted. Nutria may be bad for wetlands but they’re a great protein source for dogs—leaner than turkey or chicken and hormone-free. Established with a grant in 2011 from The Barataria-Terrebonne National Estuary Program (www.btnep.org), we’re on a mission to employ man’s best friend to help in the fight to conserve our wetlands. Along the way, we hope to educate a few humans about wetlands and invasive species as well as support regional farmers. Check us out at http://www.marshdog.com.